Sarah Jarosz was on main stage for her second performance of the weekend, having played stage 2 on the Saturday. For those who saw her the rpevious day, todays performance was fairly similar, but on the bigger stage the way she and her two fellow musicians set up so close together just looked slightly odd - as though she isn't used to bigger stages. Her set today included several covers including "Come on up to the house", a Tom Waits song she chose to end her set with. The popular Irish group The High kings are next. As well as singing Irish folk songs they also do some more modern songs including a great cover of "Dirty old town" and a lively version of "Whiskey in the jar". They're very good at getting the crowd involved and singing along and go down well with the crowd. In the programme there was a "surprise guest" slot, and the tent was packed out when it was revealed to be Kate Rusby who delivered a great set before Aly Bain and Phil Cunningham took to the stage for their final set of the weekend. Oysterband were on main stage and put in a great set which included several songs from their latest album, Diamonds in the water. On stage two, The rails, the band fronted by Richard Thompson's daughter and her husband, brought some rock to the folk festival. Their music would equally have been at home at the Cambridge Rock festival, and despite being more rock than folk they went down well with the folk festival crowd. Julie Fowlis is a Scottish singer who sang at commonwealth games. She's from the western isles and sings in Gaelic and has a beautiful voice. It's a very pleasant set to just sit back and listen to. Over on the second stage, Lindi Ortega stands out with her bright red lipstick and her red boots paired with a black dress covered in skulls. It's not just her appearance that gets the attention, it's her personality when talking between songs, and her music. It's simply done - just her singing and playing acoustic guitar but it's so well done that it's a really enjoying performance to watch. 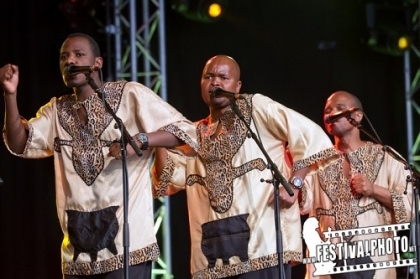 Ladysmith Black mambazo are a band that should need no introduction. For most people they first heard the group when they performed on Paul Simon's Graceland album in 1985, while their recording of "Inkanyezi Nezazi" ("The Star and the Wiseman") being used on a Heinz TV advert in 1997 gave them a hit single and brought them to the attention of even more people. I've seen the group perform live with Paul Simon but this was my first time seeing one of their own performances. Although A capella performances are generally not my thing, there's something magical about the African sounds of Ladysmith Black mambazo, and their whole performance is fantastic. For the final song they invite a choir to join them on stage. A great performance. Van Morrison was next up and his reputation as being "somewhat demanding" (ok a total diva) seemed to be justified as the relaxed atmosphere backstage was replaced with areas out of bounds and reserved purely for him and his entourage. It's no wonder the crew were looking more stressed. He came on stage and started almost ten minutes early which is unusual for a headliner, and he took centre stage surrounded by music stands, guitars, and other bits of kit that seemed to make it quite hard to get a good view of him. 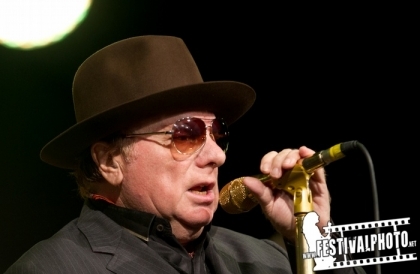 Still, when someone is superb musically you can put up with a lot, and with hits like "Gloria" and "Brown eyed girl" included in his set then Van Morrison was always going to go down well with the crowd. A great end to a superb weekend of music. While the event is a Folk festival and there are a lot of folk acts on the bill, the lineup is far more diverse than the name suggests - there really has been an excellent mix of acts with different sounds and that makes the festival far more interesting than it would be if it was more narrowly limited to pure folk acts.